I may have mentioned that I have been a busy little beaver working on some cakes for a friend’s wedding. I don’t think I was working hard enough. A lot of stuff I like saving for the day before and day of so it’s more fresh. But a few of the items definitely needed more time and thought put into it. Now after the fact I can see so many little things that I could have done to improve the cakes. Guess it’s just another one of those lessons learned moments and move on from here. The bride and groom loved them no matter what I thought and I guess that is the most important thing isn’t it? The first and most odd thing I had to work on was the groom’s cake. This was going to be a surprise for him. 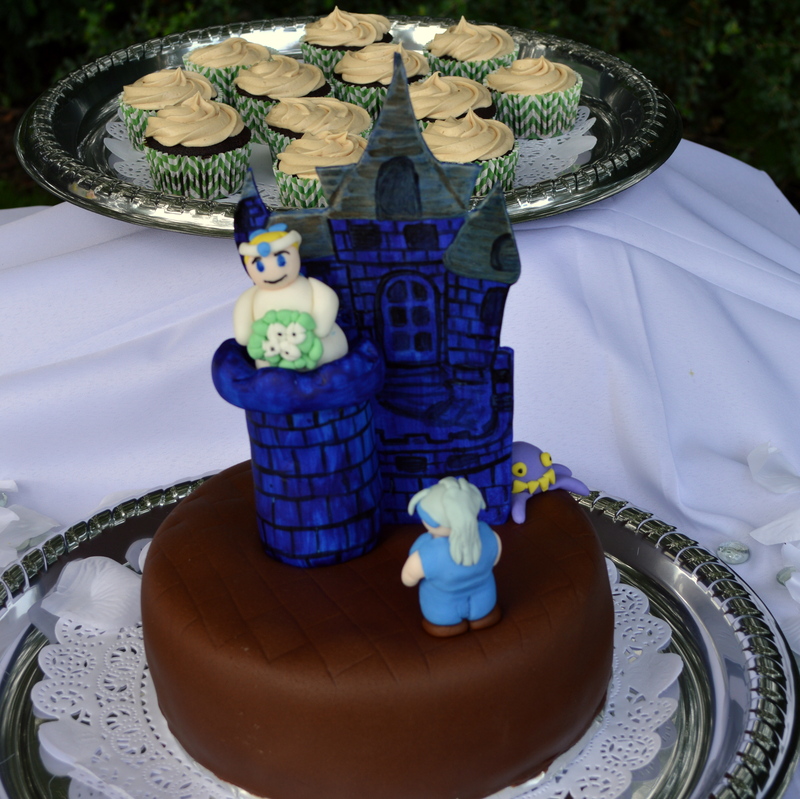 He knew he was getting a groom’s cake but he didn’t know that my friend requested a specific scene from one of his favorite games. We had the hardest time finding pictures anywhere of this scene. There bits and pieces here and there and because I’m totally unfamiliar with the game I had no idea where to start. 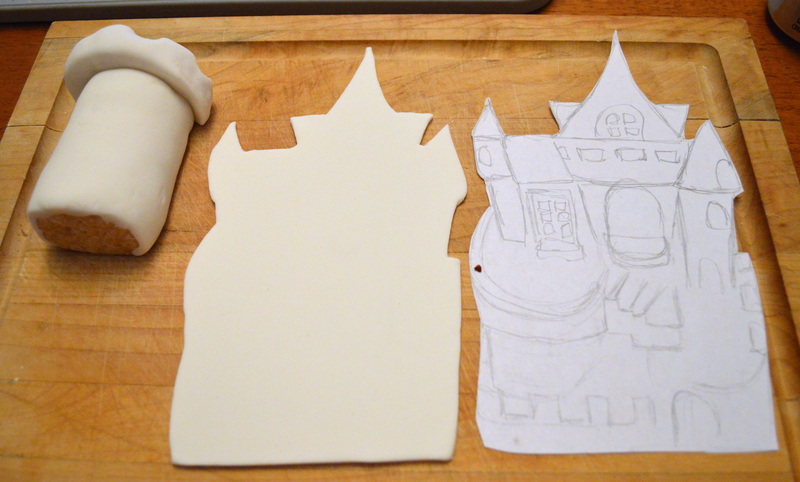 So I started with the castle. 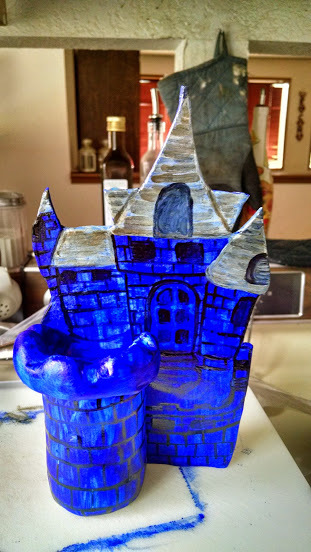 The whole premise of the scene is set in an opera house, so I figured I’d go with a castle backdrop like you would see on stage at a play with a rice krispie treat turret for the “bride”. I used a 50/50 mixture of gum paste and fondant hoping it would hold up better. Pastillage probably would have been more sturdy but I’m not very experienced with it. Next step was to paint the castle. I used paste food coloring and some vodka which helps the food coloring dry better without making everything sticky. It didn’t turn out quite how I envisioned it, but then I started thinking that the game graphics are very simplistic. Think early Mario brothers and the very pixelated characters and you’ll understand why wasn’t too concerned with the simplicity of the castle. The groom had one request during this entire wedding and it was a last minute one. He wanted salted caramel filling for the wedding cake. The bride wasn’t too keen on that idea because she already said simple and white. I suggested a groom’s cake. This way it is what he wants and he can pick a specific theme. That is how I ended up making this cake. So I made my standard chocolate cake. For the first time ever I used parchment paper in the bottom of the pan. It’s supposed to be perfect right? Nope, one of the cakes kind of crumbled and broke apart around the edges. I’ve never, ever had a problem with just using shortening and flour in the pan. Why I decided I needed to try parchment paper I can’t tell you. But I thought I could still work with it. Then there was the salted caramel. Can I tell you that I’ve never tried making it before, but figured it can’t be that hard. It’s not, but it is touchy and waiting until the night before to make it if you’ve never made it before is a really stupid idea! But it got made! I decided that a caramel frosting would go really well with the caramel filling and used one I’ve used before on my zucchini cupcakes. So check out this disaster in the making. Disaster in the making. That caramel frosting is not going to hold the caramel filling. There is no way that frosting dam is going to hold in that caramel. I originally put a light layer of frosting on the cake and then added the caramel sauce, but obviously I was a bit too liberal in my use. Add in the crumbly cake that I plopped on top of this and let me just tell you it wasn’t a pretty sight. I ended up tossing the whole thing I was so upset. So it’s 9 am the morning of the wedding and I am starting to bake all new chocolate cakes and have to make new caramel frosting because I didn’t have enough. Talk about stressful. I’m telling you this because no matter how pretty cakes look there is always something going wrong. When I started this blog I wanted to make sure that the good, the bad and the ugly were posted, not just the good stuff. What fun is there in that? 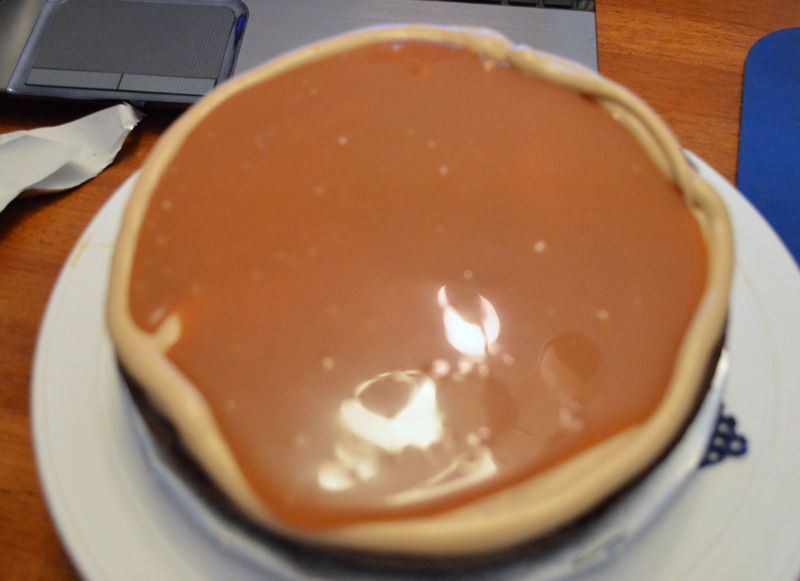 This time I just put the frosting dam in place and then spread a light layer of the caramel filling directly on the cake and it worked perfectly, no seepage. I was concerned that the filling would soak into the cake and they wouldn’t be able to taste it. After sitting for many hours it was perfect. The groom loved it and was happy he got his one wish of salted caramel. But, this put me at least two hours behind and this is where I should have spent time a few days ago making the figures for the cake. I spent one hour prior to leaving the house trying to get the figures done. I thought they looked awful. Even trying to keep in mind that the characters are very simplistic didn’t help. But I had no choice and at least it was obvious to those in the know who the characters were. The end result was all the bride was hoping for, because everyone who ever played the game knew immediately what the scene was and that’s all she wanted. The groom thought it was hilarious and loved it too. Do you know what this is from? The cupcakes were easy thank goodness. 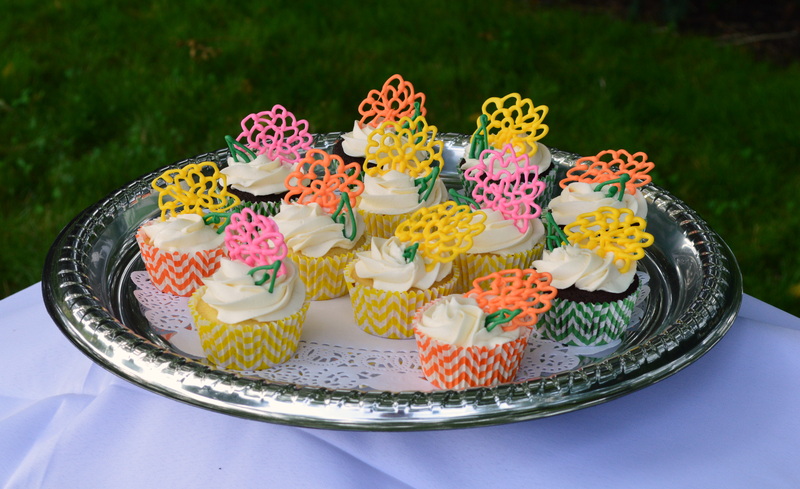 Chocolate and vanilla cupcakes with a buttercream frosting. Another thing I should have done a few days ago were the chocolate flowers, well actually it’s precolored candy melts which really helped, but hey I think it all starts out like white chocolate right? 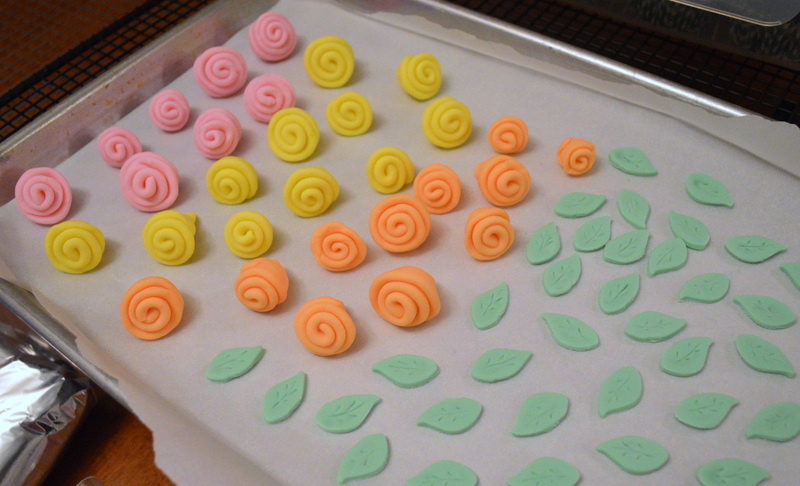 Here I am about two hours before I want to have the cakes at the wedding and I’m just starting to make the flowers. Thank goodness they were easy and dried quickly! The wedding cake was so much easier than the groom’s cake. I did make the ribbon roses a few days early. Thank goodness I didn’t wait until the last minute for those. I used this tutorial for the roses. 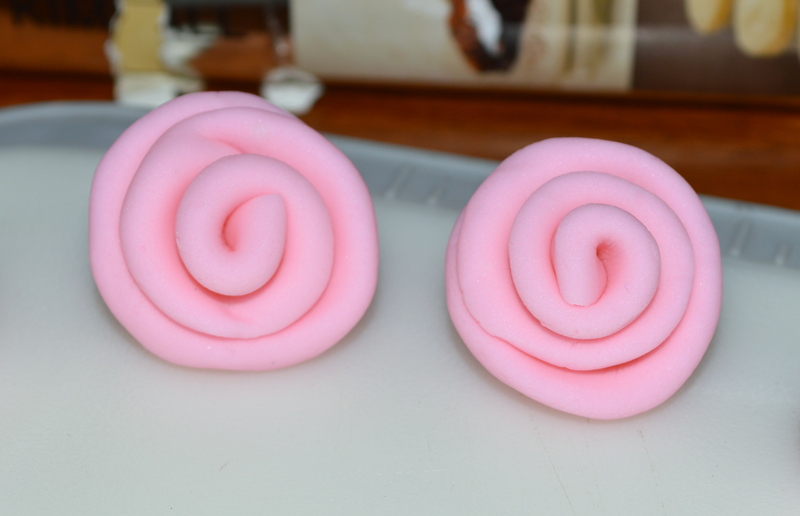 I need more practice because I would have like to have more irregular looking roses instead of simple spirals. The cake was a basic vanilla cake with buttercream frosting and my own strawberry rhubarb jam for filling. 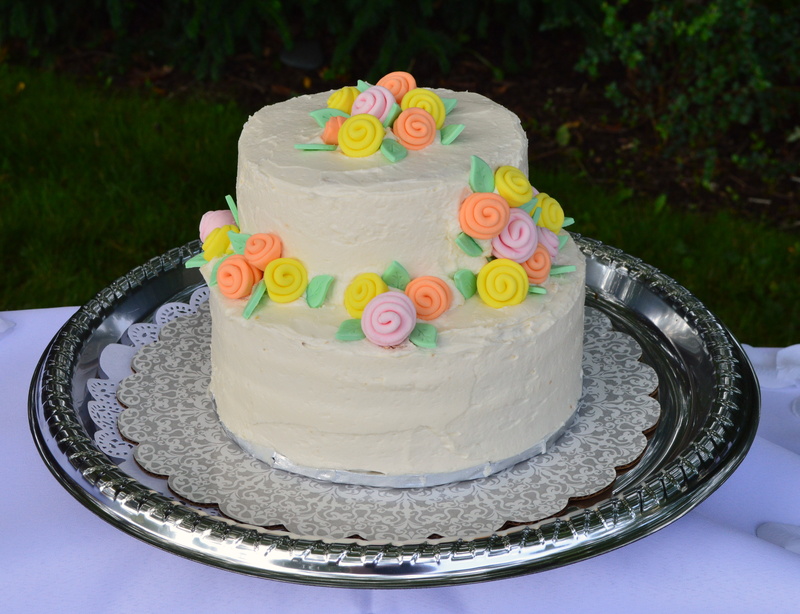 The bride wanted a simple, plain white cake but I convinced her she needed a bit of color so I told her about the flowers and she liked that idea. It really did make a simple but pretty cake. In the end it was a very successful bunch of cakes. Everyone loved them and that’s all that matters. FO Friday – Finally finished something! Yikes!! I got all stressed out just reading this! 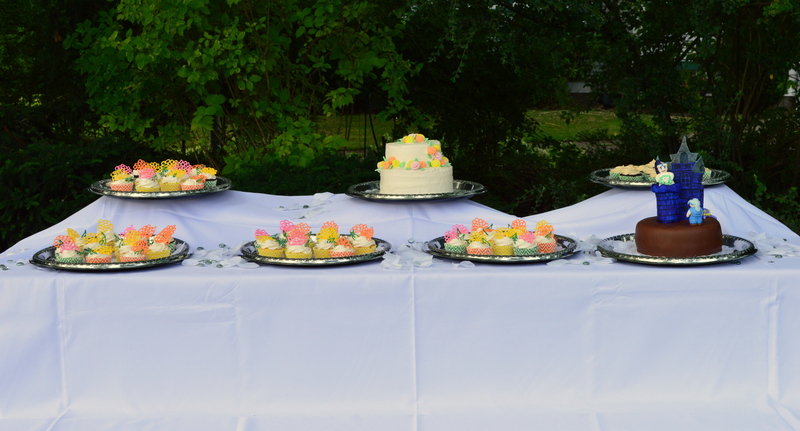 But you handled the set-backs well and all the cakes look great! Yeah, there were definitely a few stressful moments. One would think by this time I’d have learned not to procrastinate.